The first frost came in the small hours of the morning. When we woke, there were the tell-tale signs along the edges of the yard. The color seemed a little brighter, and the ferns were all brown and black, instead of the orangey gold of the day before. The basil gave its last, alone and unseen, some time in the night. All that remained were some black stalks, and a few withered leaves, the edges curled. If I sound a bit melancholy, well, that's because I am. 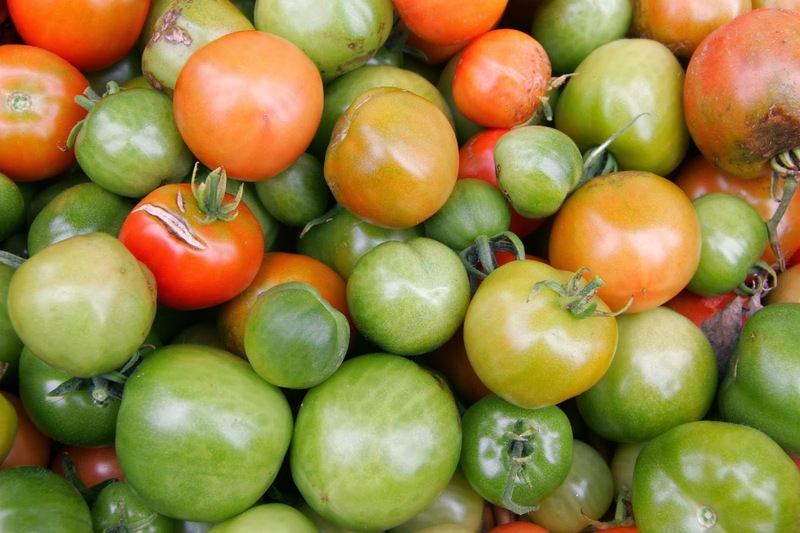 I went out this morning and picked every last tomato, green and ripe alike. I'll be honest, picking those heirloom yellow pear tomatoes, still green, almost brought a tear to my eye. I'd like to say that I have mixed feelings on the subject, that the pain of no more tomatoes was balanced by not having to weed, but it just wouldn't be true. The carrots were all gone a week ago, the green beans almost a month, and I felt the same way. The fact that the first frost is two to three weeks late this year just seems no compensation at all. The season is changing, and the house and yard smell of fall. The whiff of wood smoke, the dry rotting smell of fallen leaves, the sharp and faintly spicy smell of freshly dug onions, and underneath it, the sweet smell of apples, ripening in their bushel boxes in the kitchen. I came in after puttering and picking to the rich smell of pork and beans in the crock pot, loaded with maple syrup and onions. The sweet fatty taste was exactly what my body craved after working outside on a crisp morning. It was made all the more seasonal with a glass of cold apple cider. were what one could call prize winning. It fact, I do believe they are the smallest specimens I've ever seen. It caused Shawn and I to smile nearly every time we checked on them this summer. 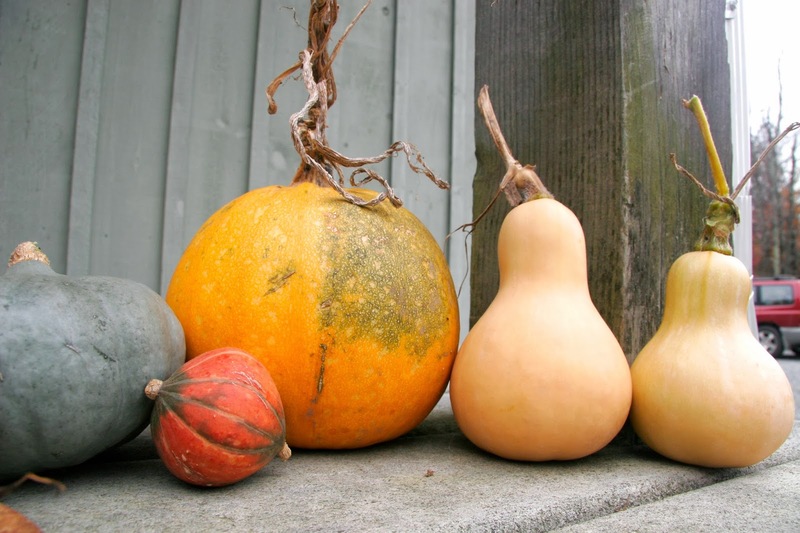 The two tiny butternut squashes are definitely destined for soup, probably this weekend. The tiny mystery pumpkin (I swear, we didn't plant one!) will likely meet the same fate. As for the others? Only time will tell. Until then, they will keep nicely in the basement. The tomatoes will be sorted. Those which have started to ripen will be left on a sunny counter to do so, then be sliced and dried. The rest will be made into green tomato relish. This feels almost like the reading of a will. What is left at the end must be taken stock of, and disposed of to its proper place and use. In my defense, I am aware that I am being extraordinarily sentimental. But I have so deeply enjoyed having a garden again this summer that it feels like I'd like it to go on forever. Nothing does, however, for if it did, how would we ever appreciate it? But still... the soul sighs for sweet, fresh tomatoes, the sharp bite of basil, warm breezy days, and the drone of crickets. I do enjoy the things of fall, just as much as those of summer. I love sitting and knitting by the fire, and wrapping myself up in wool and cashmere, long walks with the dog in the crisp air, not to mention all of the glorious color. And there are the apples still, coming in to the house from a local orchard at regular enough intervals to make me feel like a little momma squirrel. They are waiting in their boxes to be made into apple sauce, apple butter, fruit leather with cinnamon, and dried apple rings. But today I need to put up relish with the last of the green tomatoes. So I'll take a deep breath, and step out of the last of summer.